After months of allegations that he violated ethics rules, New York Rep. Charles Rangel announced Wednesday morning that he has requested a leave of absence as chairman of the powerful House Ways and Means Committee. During a brief press conference, Rangel said that he’d sent a letter to House Speaker Nancy Pelosi requesting a leave of absence as chairman until his ethics investigations have been completed. He declined to take questions. After being admonished by the House ethics panel for not properly disclosing the financial details of corporate-sponsored trips that he took to the Caribbean in 2007 and 2008, Republicans had planned to force a Wednesday vote to remove Rangel from his chairmanship and even some Democrats are calling for his gavel. In light of Rangel’s leave of absence, it is unclear whether that vote will still take place. 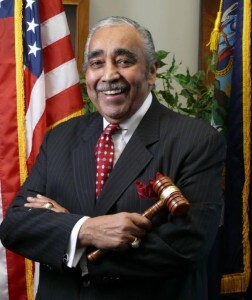 Rangel, a 20-term lawmaker, founding member of the Congressional Black Caucus, and dean of the New York delegation is also facing other more serious allegations, such as failure to pay federal taxes on rental income from a villa he owns in the Dominican Republic, his use of four rent-controlled apartments in Harlem, which violates House rules of accepting gifts over $50; and using congressional stationary for fund-raising purposes. Following an hour-long meeting with Speaker Nancy Pelosi Tuesday night, Rangel was confident that he would retain his chairmanship, going so far as to say:Â “You bet your life,â€ when asked if he would keep the position. Rangel’s leave of absence ends the distraction his presence had caused for for Democrats who had rallied around the tainted lawmaker. Now, Democratic lawmakersÂ can continue to push forward healthcare reform and employment legislation. Voting in favor of these bills would have been difficult enough for vulnerable Democrats who already fear the wrath of voters back home and can ill afford to deal with Republicans targeting them for supporting a member who’s alleged to be ethically challenged.